Abdullah and Abdelqayom Albasha competing in Jordan. If this were last year, Abdullah Albasha would be in Boston right now, ready to be the only resident of Jordan racing the world’s oldest marathon. He would have received his travel visa a mere four days before the Boston Marathon and then spent two months of pay to make the 13-plus-hour flight in the middle of the night. 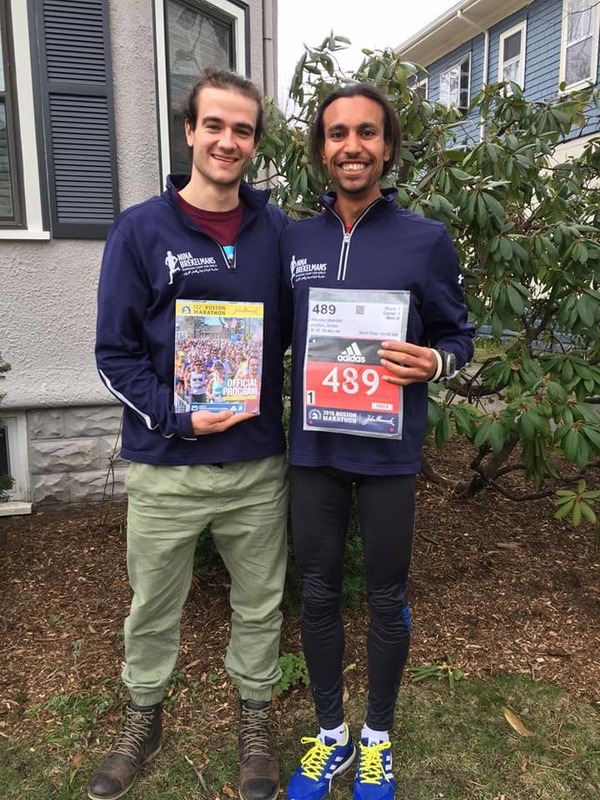 But this is 2019, and as I write this, Abdullah is once again a Boston Marathon qualifier, but this time is still waiting for his visa. Same goes for his brother Abdelqayom who, after hearing about Abdullah’s race experience, stepped up from his preferred half marathon distance to get his own “BQ” at the Dubai Marathon (he ran 2:40). The journey to Boston started while on a run in Amman in 2015 with a group of Americans studying Arabic. It was as simple as one of the students saying to the brothers: You should run the Boston Marathon. 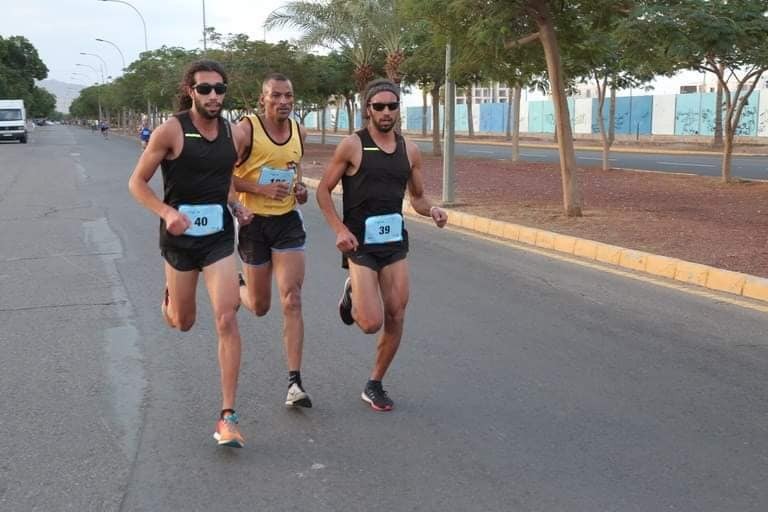 Abdullah and Abdelqayom were then still new to the sport of running. They had started running for fitness, then got hooked into races around Amman. After the run, they researched the race, learned more about its history, marveled at stories about massive crowds of loud, adoring spectators, and simply knew they had to do it. “We liked the story of the Boston Marathon,” Abdelqayom recalls. So, as they pursue a 2020 Olympic dream and a goal to run all six world major marathons, the brothers have set their sights first on Boston. This has created a tough choice: train enough to get faster and race well, or – as they lack sponsorship – work enough to afford the trip. When we talked, it was 2 a.m. Amman time. Abdullah and Abdelqayom, who visited the U.S. embassy to apply for their visa in November, had just finished a restaurant shift. At an international school where they coach, a student’s parent had expressed interest in sponsoring their trip to Boston, they say. This could have enabled them to work a few less shifts and run a few more miles. Without a visa, though, the parent had nothing to sponsor. Undeterred, Abdullah and Abdelqayom kept working, hopeful the visa would come through. The Albashas surely will, just like Abdullah kept going in last year’s Boston Marathon as bitter cold, pouring rain and devastating winds slowed the 2:39 marathoner down to what runners sometimes call a personal worst. These were possibly the toughest conditions in the race’s then-122-year history, but Abdullah refused to drop out. It’s not unlike the encouragement provided by Abdullah and Abdelqayom at the Nina Brekelmans Running Camp for Girls. The brothers have supported our camp for three years as steadfast male allies and key volunteers in our women-led organization. Last year, Abdullah shared with the girls the story of someone he met at the Boston Marathon expo: Katherine Switzer, the first woman to run the Boston Marathon. The way he sees it, the girls participating in our annual five-week camp and race could revolutionize running in Jordan like Switzer did in the United States. Since discovering the joy of running, Abdullah and Abdelqayom have been committed to helping others feel that joy too – and, like Nina, who they both met, using running as a platform to bring people together and make a difference. They come from a humble family and came to Jordan as refugees from Iraq during the war. Now the running camp has helped bring things full circle by enabling them to inspire women and girls primarily of refugee backgrounds from their native Iraq, as well as Syria, Palestine and Sudan. Many of these girls, like the Albasha brothers, have overcome enormous obstacles in their lives to make their way to a safer life in Jordan. Our foundation is proud of Abdullah and Abdelqayom, and we’re grateful for their support. While they won’t be in Boston this year, we know they will be inspiring our campers in Jordan – both by what they say, and by what they do in races to come.